The Real-time Software Telemetry Processing System (RT-STPS) ingests raw telemetry data and produces products, including sorted Consultative Committee for Space Data Systems (CCSDS) packets and Virtual Channel Data Units (VCDUs). RT-STPS is capable of producing output for any instrument onboard SNPP. RT-STPS functions in two modes: Standalone, or as an IPOPP plug-in (Linux only), and it supports a variety of output formats. Click here to view the latest version of the RT-STPS User's Guide for more details. Installed as a server RT-STPS will operate continuously, receiving data from a port or a file and outputting results to files and sockets as specified in a configuration file. A separate interface can be used to invoke RT-STPS from the command line. The RT-STPS package includes two main utilities: the viewer and the sender. The viewer displays the progress of the server as it runs, and it can be used to load server configuration files. The sender copies a raw data file to the server for processing. 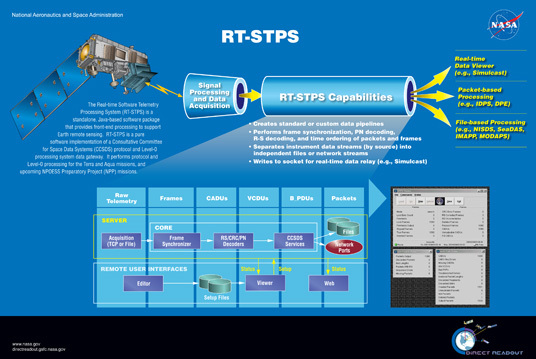 The RT-STPS architecture is depicted in the figure at right. Each server component performs a typical part of the overall CCSDS processing from raw telemetry frames to packets. Click here to download the latest version of the RT-STPS package for either Linux or Windows.